Plans for next year already call for a lofty goal of $1.5 million. LEWISTON — For those participating in the second day of the ninth annual Dempsey Challenge, the rain didn’t affect their compassion and drive, and those gearing up for a long bike ride were still smiling. Day 2 at Simard-Payne Memorial Park in Lewiston brought over 1,000 cyclists, riding 10, 25, 50, 70 or 100 miles. The 35 participants of the two-day bike ride left Saturday and returned from Freeport on Sunday, having biked a total of 140 miles. 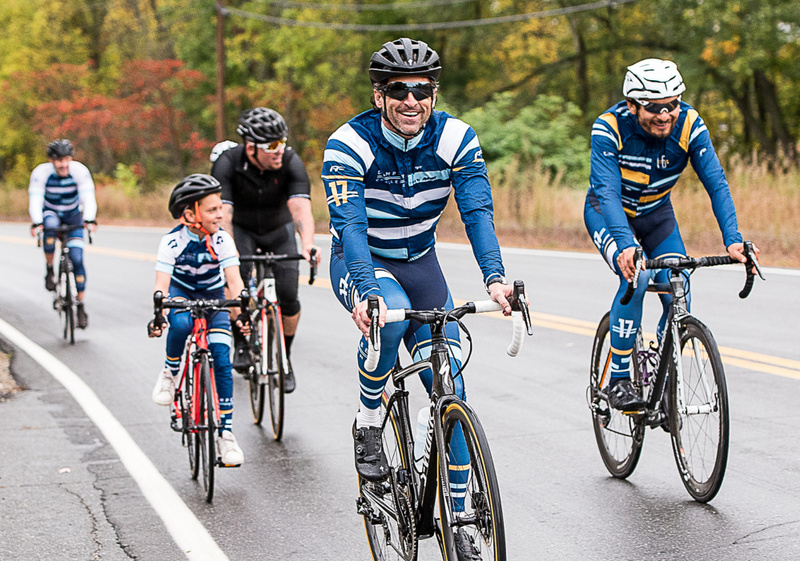 Actor Patrick Dempsey participated in the 25-mile ride, and was joined by his wife, Jillian, and twin boys, Darby and Sullivan. Jillian said their daughter, Tallula, was sick and unable to attend. Dempsey, who grew up in Buckfield, kicked off the event with his usual charm and gratitude, and with help from a few guests, including Lewiston Mayor Robert Macdonald and Auburn Mayor Jonathan LaBonte. The Dempsey Challenge “put us on the map,” said Macdonald, who is leaving office in November, along with LaBonte. Dempsey rode in the 25-mile ride with Darby, who sped way ahead of the rest of the riders, while Jillian and Sullivan rode about 10 miles. “I’m more of the talkative one,” 10-year-old Sullivan Dempsey said. “You exercise your vocal chords more,” his mother said playfully. She added that she was “almost as impressed” with the people standing on the side of the road, cheering with bells, as she was with the bikers in the challenge. “It’s just so nice, they’re so dedicated and supportive,” Jillian said. The cheerleaders along the road were from around the world. A group of four women – Rabab Kazem of Kuwait, Isabell Brueck of Germany, Gladys Chow of Venezuela and Tracy Karamon of Michigan – all came just for the challenge. For them, it was a “mini vacation,” and they get to not only support those fighting cancer, but also see Brueck’s favorite race car driver, Patrick Dempsey. Locals came to cheer on the cyclists, too. Bill Burns of South Paris was there with Boy Scout Troop 121 supporting their Scoutmaster Don Malpass and his son, Cody, who rode in the challenge. “We like to cheer people on, and it’s good to see Patrick,” Burns said. Meanwhile, back at Simard-Payne Memorial Park, volunteers were greeting returning bikers, handling mishaps such as flat tires, and beginning to clean up. “We have about 600 volunteers to cover 1,000 volunteer areas of the challenge,” said volunteer coordinator Donna Lafean. With over 3,500 participants this year, the challenge takes a lot of work, and the Dempsey Center’s marketing manager, Dani Campbell, said they’ll probably start planning next year’s event Monday. Renee Linsdon of Lewiston has volunteered at the challenge every year since the beginning. She’s also a five-time cancer survivor. “My philosophy is heaven doesn’t want me and hell is afraid I’ll take over,” she said. She has had ovarian, cervical, uterine and breast cancer, as well as melanoma and lymphoma. It’s people such as Linsdon who inspire those fighting to keep going.